Not all spiritual wisdom has to come from expressly religious works. So this week I thought to pull from one of the great pagan philosophers, Marcus Aurelius. As you may know Marcus Aurelius was Emperor of Rome during what is generally considered to be the height of the empire’s greatness. And in large part it was because of Marcus and the four emperors before him whom are known to historians as “The Five Good Emperors” (that title may seem a little weak, but consider the caliber of most people who held the office and you’ll see by comparison that’s quite a compliment). Not that he was perfect, rightly seeing that Christianity was going to shake the empire to its core he took the wrong course and went forward with typical Christian persecutions. And unlike the previous four emperors who picked men of quality to succeed them Marcus picked his son, Commodus (who was probably even crazier than Phoenix’s depiction of him in the movie Gladiator)…in Marcus’ defense he was the first of the Five Good Emperors who actually had a child to leave the empire to, so the other four may have made just as dumb moves if they had children. But the reason we turn to Marcus Aurelius is because, in all honesty, he would have rather been a philosopher pouring over ancient tomes of wisdom than be bothered running an empire…but duty called and he was bound by honor to fill the position asked of him (the best leaders are always the ones who don’t want the job…if only we could nominate people who had no desire to serve in Congress or the White House…). 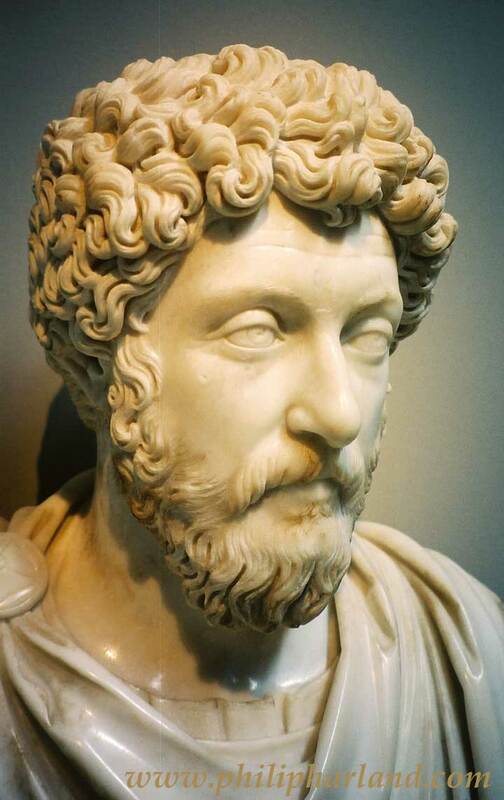 But in between running an empire that covered one quarter of the world’s population, Marcus Aurelius wrote his great work on Stoic philosophy, The Meditations. A little dry to the modern reader (ancient languages don’t often translate well when you’re trying to hold very technical meanings intact), it is a collection of aphorism on how one should live life. Because too often we give into doubt. Doubt and fear are two of the worst enemies we can have in our journey to Enlightenment. Now if you don’t feel these, you are either my hero (and I have to wonder why you’re reading this…go out there and start teaching), or very deluded (and I’m not sure I have the skills to solve that). And when we have doubt we must confront it. First by the untroubled soul. Admitting that you have doubts removes a great deal of their power over you. Second by looking at them head on and asking why you have them and what to do about them. And this, a lot of times, is where the second quote comes in. We feed off the doubts of others, because there is always someone who will see the worst in everything, and we believe them over our own hopes and let it feed our doubts. So we need to stop that. This weeks meditation. Is to spend 5-10 minutes focus on identifying our doubts. If it helps envision a large white board you are writing them on. I am a divine child of God. I am greater than this doubt. My hope in myself is more accurate than the doubts other have about me. I may not always succeed and my doubt may prove true, but not because I gave into them and let myself fail. I am a divine child of God and as such I should trust my soul which I know to have the light of God in it. So, 15-30 minutes every day this week. Identify the doubts and put them in their place.